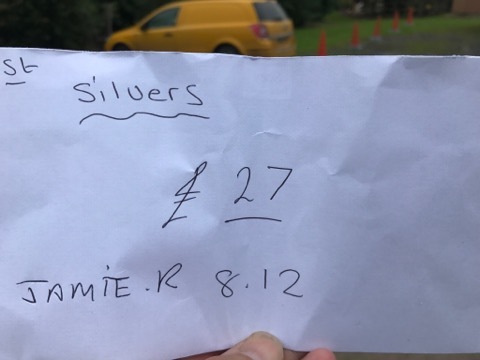 It was back to Summerhayes this week for the first time since June and looking at the latest results on Sellicks, the carp have been getting their heads down and proving to be a real nuisance for the silvers anglers. I picked Janders up and we made good time, as we pulled into the car park, the first person I saw was the Tart waving at me, I’d received a text from him asking which lake we were on today so at least I’d had time to mentally prepare myself before I saw him. 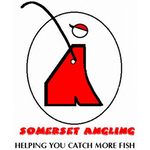 As I was getting my nets I met Matt Thomas who’d just come back to the UK after spending several years in Perth, Australia and he said he’d really enjoyed reading the blog whilst he was in Oz and it had kept him interested as there wasn’t much coarse fishing over there, cheers Matt, thanks for the great feedback! After paying our pools and having a quick coffee, Pete announced the draw and as per usual I ended up going in the bucket quite late, Janders was on 21 on the far side and I was hoping to join him but was slightly disappointed to pull out peg 7, as for the Tart, he was on 13 which has been a good area for carp and silvers in recent matches. As I took my kit to the peg I passed Bruce on peg 3, Mark Leahy on 5 and I had Dave Romain on my left on peg 9 with Gareth Lennox on 11 which was also the golden peg today. I set up a Malman 0.6 gram Pencil to fish two lines at ten metres and a 0.3 gram NG Mini Gimp for five metres and a top two plus one line on the inside to the right. The side tray was nice and simple today, just some Bait-Tech 2mm Carp and Coarse Pellets that I’d soaked the night before and added a decent helping of Special G Dark plus some 4mm Xpands for the hook. On the whistle I put in half a pot of micros on the two longer lines, the same at five metres and a modest amount on the inside which was where I started. Mark had a carp first chuck from his five metre line and Bruce had one shortly after, I gave it ten minutes but never had a bite so moved out to the right hand ten metre line. 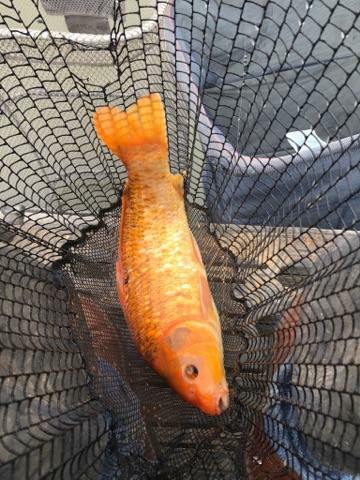 The rig settled and the float sailed away but of course I missed it!, I shipped out again and the same thing happened but this time I connected on the strike, it was obviously a carp but after a few minutes a beautiful golden koi surfaced before I netted it. My next fish didn’t feel like a carp and a lovely crucian around a pound popped up to open my silvers account. A couple of small carp followed and all around me plenty of elastic was coming out as everybody I could see was catching carp, which was fine by me as they weren’t catching silvers! I switched to my left hand line and the first bite resulted in a small 6oz tench but then the next couple of fish were carp. So with an hour gone, I probably had 1.5lb and as the Friday silvers match was won with 10lb, I wouldn’t be far off if I could carry on catching at this rate. 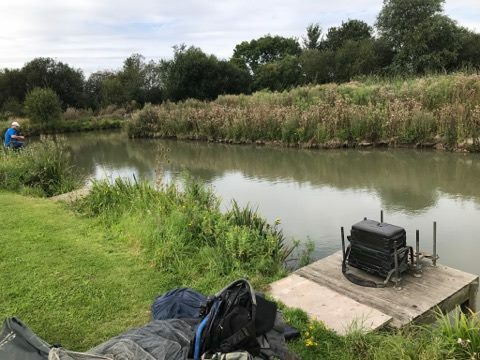 I switched to the other ten metre line and had a nice run of three skimmers and another little tench although I did lose what felt like a decent skimmer before the carp moved in but I was happy as I was still on target to do 8-10lb. Every time I shipped out I sprinkled in a few micros on the five metre line (and occasionally on the margin line) but wanted to leave it as long as possible before trying it. I was swapping between the two longer lines but carp were starting to be a real pain and I foulhooked quite a few and was having to reverse them into the net! The right hand line was definitely the more productive and I added another four skimmers to put me on 4.5lb of silvers after three hours. Things started to go a bit pear shaped in the fourth hour, I lost a decent skimmer, hooked loads of carp including another koi/ghostie, another carp did me under the pallet (ouch!) and I only added one skimmer and a tiny blade to the net. Also after a fairly bright start, it had clouded over and we had some light rain but going into the last two hours it started to lash it down. I came in on the five metre line for the first time and had to wait ages for a bite and of course when it came, I missed it! The next bite saw the elastic come jagging out of the pole tip and I just knew it would be a small tench and it was. Sport certainly wasn’t fast or furious on the shorter line but over the next hour I added another three tench between 6-12oz and I was probably up to around 6lb with sixty minutes to go but then the carp moved in on this line and I was missing loads of bites as well. Janders turned up and was looking rather moist as he hadn’t brought a coat with him, he was blaming me for saying it would be a nice day but you’d have thought he’d have known not to believe anything I say by now! He said he’d had four skimmers for about 3.5lb but wasn’t going to weigh in, while he was behind me I had my first skimmer from the shorter line, it was only about 4oz but very welcome all the same. He left me to it and headed up to see how the Tart was doing. I managed another skimmer, this one around 12oz to put me on 7lb or so and there were still fifteen minutes to go, I was praying for a couple more skimmers or a decent crucian but time was ticking by and then I missed two great bites in quick succession, had I missed my chance? Then the float sailed away with minutes to go and the way the fish was fighting, I was convinced it was going to be a decent tench and was slightly gutted when a carp around 2lb came to the top, I was just about to go back out when Adie called time. 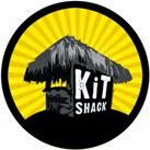 Typically, no sooner than we started to pack our kit away, it stopped raining! 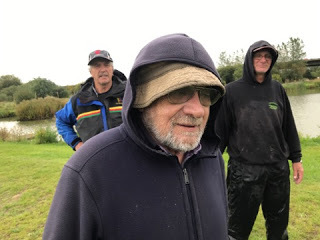 I took my kit back to the car and we all assembled at Bruce’s peg to await the scales, the Tart arrived and said he’d caught a load of carp but only had a couple of roach and as we have a pound on silvers and a pound on carp, it was looking like it would end up quits. Rob Birch said he’d done alright and had between 8-10lb of silvers and I knew I didn’t have double figures. Bruce set the pace with 103lb 12oz before Mark just edged ahead with 105lb 2oz, then it was my turn and I had around a dozen carp for 35lb and then my silvers went 8lb 12oz so I wasn’t too far out with my estimate. 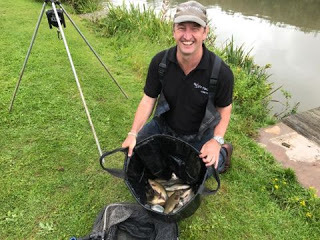 Dave Romain then took the lead with 109lb 9oz before we got to Gareth on the golden peg, after several weighs his total was called out at 141lb 9oz and he was in for a bumper payday. Then we got to the Tart and after his three carp nets were weighed, Pete called out 139lb 8oz and he was one fish short. Rob was next and when he pulled his silvers net out, it looked like it was going to be tight and his weight was called at 8lb 9oz – phew! Chris W had done well to weigh 59lb 5oz from peg 17, especially as five sections of his pole was sticking out of the far bank! 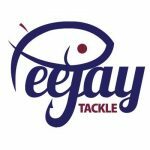 Alan Jenkins had 2lb of silvers, Janders didn’t weigh (and conceded his pound) and then Matt T was last to weigh and had 67lb 2oz from peg 23. Back at the results and after a very welcome coffee, Pete did the results and Gareth was called out as the winner and collected a nice fat envelope, the Tart was second and Dave was third. I won the silvers and picked up £27 with Rob in second place. So an enjoyable day apart from the weather, the Summerhayes boat crew managed to retrieve Chris’s pole sections, also I went and used the new toilet block and I was very impressed with the new facilities, lets hope the anglers look after them.